BK-2C-B (crystal) is a totally new synthetic psychedelic drug, which belongs to phenethylamine chemical class. It is considered to be acting like a partial agonist of 5HT2A receptor, which leads to psychedelic effect. The systematic name of this substance is 2-Amino-1-(4-bromo-2,5-dimethoxyphenyl)ethan-1-one. The molar mass of BK-2C-B (crystal) is 310.572 g/mol. The purity of the substance reaches 99.7%. This drug is not intended for human or veterinary application. 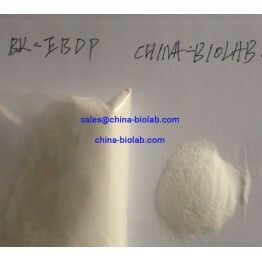 You can buy BK-2C-B (crystal) on our website china-biolab.com only for certificated laboratory research. The biological and pharmacological properties of BK-2C-B (crystal) are unknown, because of little history of human usage. The drug was first tried only in 2014. BK-2C-B (crystal) doesn`t possess any habit-forming properties like all psychedelic drugs; it has the opposite influence. All the known effects produced by this phenethylamine analogue have no scientific background. They are based on the reviews of the users, which must be taken with caution. Anyway, those, who had tried this drug reported on such symptoms as nausea, increased heart rate, spontaneous tactile sensations, delusions, time distortion, hallucinations and this list is not full. The toxicity and long-term effect of the substance on the human body haven t been studied. Be careful and responsible if you buy BK-2C-B (crystal) online. If you are looking for BK-2C-B (crystal) for sale, you must be aware that it is illegal to produce, supply or import this substance in the UK. Though this drug is not scheduled in the USA, the customers should be careful, because it may come under the US Analogue Federal Act being an analogue of 2C-B. Our website offers BK-2C-B (crystal) online on the best terms concerning the price and the quality of the product. Choose our services and you won`t be disappointed.